Tom Clancy’s The Division is unlike any Tom Clancy game before it. It has a lot of the same themes that those games had, stuff like future military tech, political storylines and combat that feels tactical. But instead of being a more standard shooter, like the older Rainbow Six games, The Division is an open world RPG with social and MMO elements. If that sounds weird, it is. And yet, for the most part, it works really well. The basic setup is that a deadly disease, similar to smallpox, is let loose in New York. The way the terrorists spread the disease is on $20 bills. And they releases these disease ridden bills into New York on Black Friday, the biggest shopping day in the United States. As you might expect, the disease spreads fast. Nicknamed “The Dollar Flu.” millions of people die and New York is quarantined and put under military lockdown. That’s where you come in. You are a Division agent. You are part of classified program called “Directive 51” which is basically a way for the Federal Government to protect the government and its people using any means necessary. You and other Division agents live a normal life, waiting for the day you get activated and given orders. 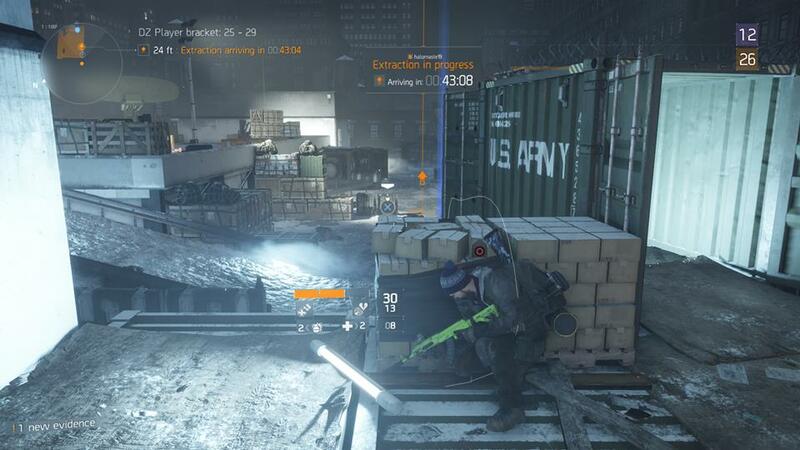 Once activated Division agents are given full authority to do whatever they need to do to complete their mission. What this basically boils down to is that you and your fellow agents can freely explore most of New York City, killing any bad guys you see and grabbing anything useful you need. The first thing you do in The Division is create a character and it’s a really disappointing start. The character creator in this game is terrible. There are very few options and some weird restrictions. For example, do you want a character with earrings and sunglasses? Nope, you can’t do that. These restrictions and a lack of choices might seem unimportant, but The Division is game that Ubisoft is positioning as something players will spend hours and hours in. So it’s a bummer that you might get stuck with a character you don’t really like. 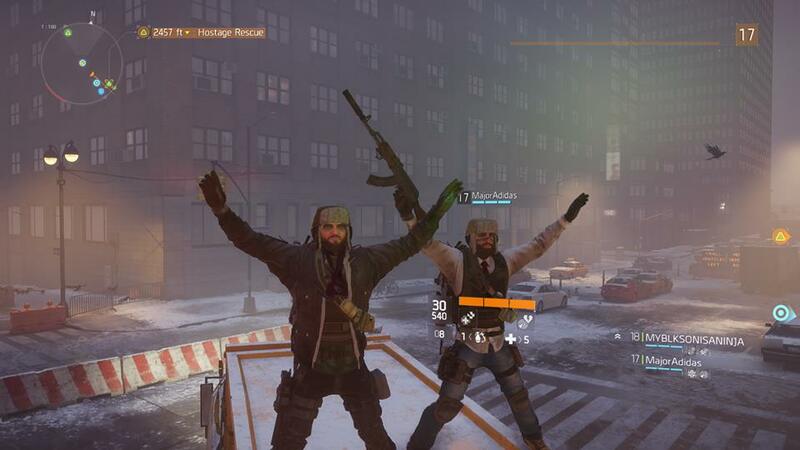 On the plus side, there are a TON of clothing options in The Division. Hundreds of jackets, shirts, hats and more. So at least you can dress how you want, even if you don’t get the face you want. And yes there are beards. New York City is huge and gorgeous. One of the first things that I noticed about The Division and something that I noticed throughout, was the attention to detail and amazing visual quality of the game. The lighting is great and as the weather changes, from bright sunny days to snowy blizzards, I constantly found myself stopping to just look around at all the buildings and signs. The detail packed into the world is fantastic and one of the most impressive parts of The Division. The menus and UI, while filled with tons of numbers, also look great. I love how the HUD just sort of floats near you at all times. It conveys information in a easy to read way, but does it with some style. The Division has a slick look to it and I was always excited to see new parts of New York. And you can explore right away, basically. After making a character and setting up a base you can go wherever you want, of course you might run into higher level enemies or zones that are contaminated. So you’ll have to be careful or find yourself in a deadly firefight. That’s one of my favorite parts of The Division, the combat. If you’ve played a Ubisoft game in the past few years you know this style of combat. You can take cover, blind fire, mantle over low cover, climb over fences and more. (And yes, you can shut doors just like in the E3 demo. You even get a Trophy/Achievement for it.) But The Division’s combat feels really good. Dodging from cover to cover feels exciting. You can also aim at cover with your camera and hold a button to automatically run to that cover. I like how you feel mobile in The Division and it has a lot of verticality. You can dodge roll in any direction, useful for getting away from grenades. Or climb onto the roofs of buildings to get a good ambush position on your enemies. You can even suppress them, allowing your teammates to rush them or run away to safety. On the subject of combat and enemies, most of the enemies in The Division feel too similar. Most of the enemies you fight feel like random people shooting you. The only exception is The Cleaners, a group of garbage men (and garbage women) who decided to grab flamethrowers and burn everything and everyone. The Cleaners feel different. Fighting them is about keeping your distance so you don't get burned. And if you are a crack shot you can hit their fuel tanks and make them explode, which causes their friends to run away. I really wish the rest of the enemies were as fleshed out or interesting as The Cleaners. While I'm wishing, I wish all the enemies had better AI too. The enemy AI works... okay. I saw some enemies jump over cover for no reason or run towards me, then away, then back, then away until I killed them. The AI isn’t broken or terrible, I’ve had fights with them where they flanked me and killed me. So they can provide a challenge, especially if you set the difficulty of the missions to hard, which I recommend. On this difficulty the combat feels more brutal and satisfying. It also forces you to closely work with your teammates. That’s my other recommendation: Play with other people. Playing The Division alone can be a bit of slog. Having friends who can help you and who you can talk to is important. I played a few hours alone and quickly found myself getting bored between combat. Having at least one friend with me helped keep the game from getting dull. It allows you to combine your weapons and abilities in more interesting ways. 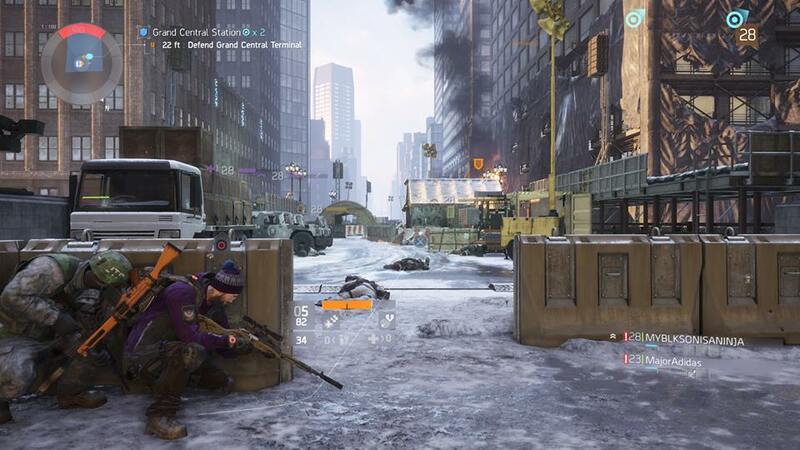 Unlike most RPG-type games, the way you unlock abilities in The Division is through upgrading your main base of operations. 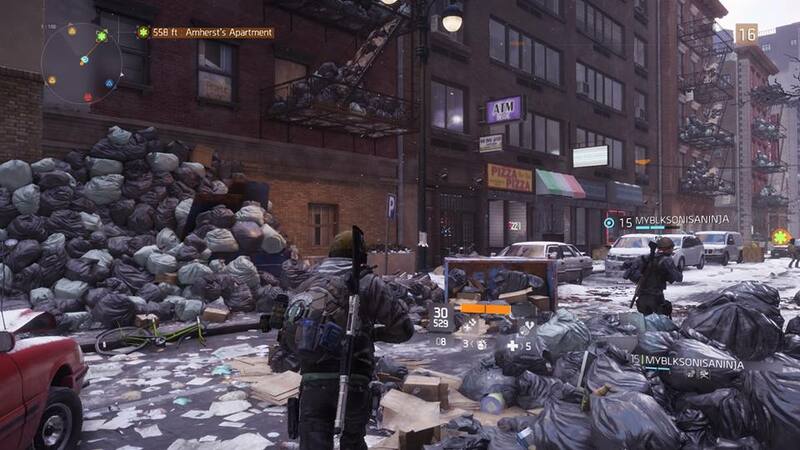 This large building, the New York City Post Office building, is where you will spend a lot of time crafting loot, upgrading the base and improving your loot. As you complete missions you unlock resources that lets you upgrade different parts of your base. 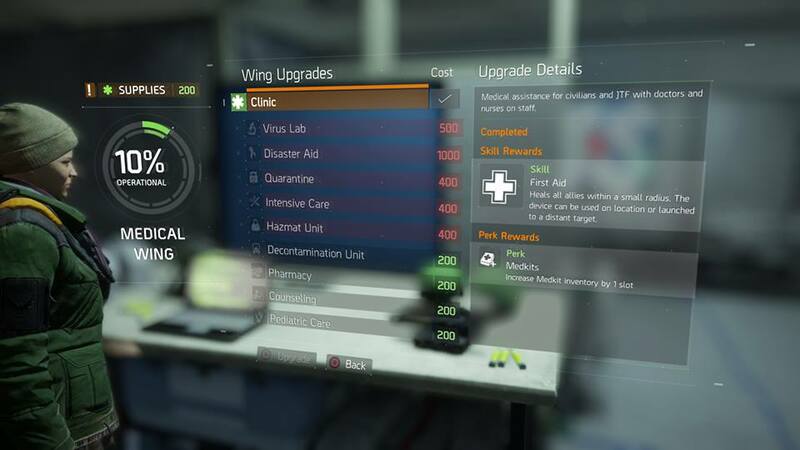 For example, if you upgrade your medical wing you can unlock abilities like a healing gun or health station. Continue to upgrade your base and you will even unlock mods for your abilities. So your healing gun can now revive people who are down, which can be very useful. Locking abilities behind the base upgrades is actually a smart idea. It allows players to focus on the abilities they want. Do you want the ability to set down portable cove? Go do side missions and main missions that award you tech resource points. All of these abilities can not only be modded but augmented by your stats. And there a lot of stats in The Division. Each piece of loot has all sorts of stats, talents and bonuses. A pair of gloves might increase your damage with pistols or a sniper rifle might give you health for each kill you get. Just like in Diablo, you can re-roll these stats and abilities on these items. Each of these items can have upgrade slots that you can fill with mods. Add a scope to an assault rifle or extra damage to a pair of knee-pads. There is a lot in The Division. 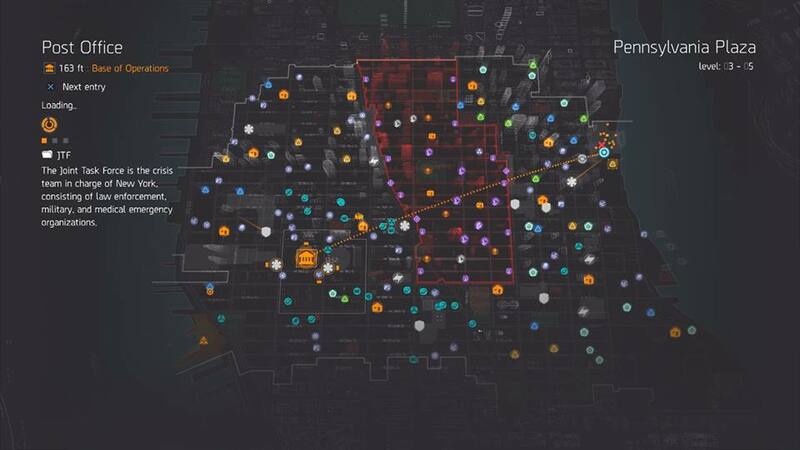 If you were expecting a shooter with a basic skill tree and some upgrades, you might be surprised at how much depth is in The Division and how much flexibility everything has. You’ll probably be disappointed by the amount of repetitive side content the map is filled with. A lot of the missions boil down to this: Shoot guys for two minutes and sometimes shoot a bigger, badder boss at the end. There is some variety. Like missions that have you guarding an NPC or carrying boxes to a certain point. But even those missions are repeated over a dozen times. Thankfully the combat is fun enough and the loot given out frequently enough that I never felt tired of doing side missions or grabbing collectibles. If all you care about is finishing the story you can avoid most of the side content and still be leveled up high enough to finish the final mission. Well, I say final mission, but with tons of DLC announced (some free and some paid) it seems silly to call it the final mission. Besides, the story ends on a bit of cliffhanger. At least I think it does. I barely paid attention. The story is really lackluster. The writing is either boring, bad or annoying and some of the voice acting is downright awful. I also found it really weird that all around me people were dying. The city was filled with crime, disease and suffering. People you meet seem hopeless, many of them crying or injured. The messages you get from your team are always about bad people doing terrible things, usually to innocent people. And yet you run into vendors who yell at you about buying a new laser sight for your assault rifle. It can sometimes feel hard to have fun in this world that feels so similar to our own, but filled with awful things. 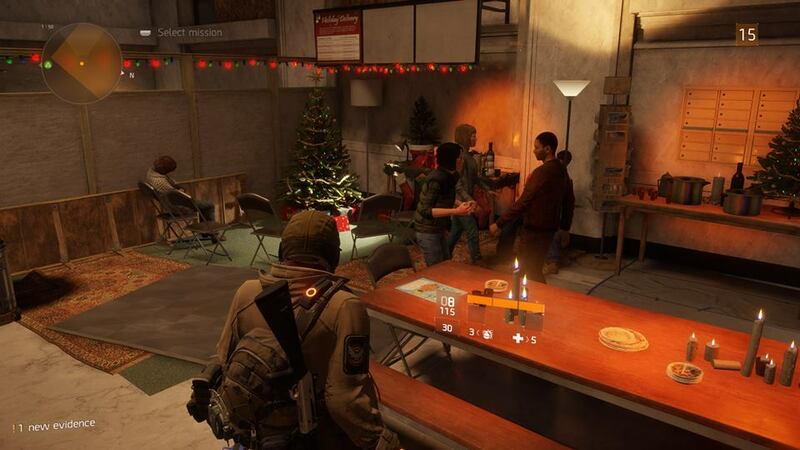 The best storytelling in The Division actually happens at your base of operations. As you upgrade it the base becomes more and more filled with people and life. Eventually the empty and cold building is replaced with a warm and oddly cozy area. People playing guitar, telling stories, kids playing, people sleeping and other people milling about. Some of them even laughing and telling jokes. This was one of my favorite parts of The Division, watching my base fill up with life and knowing I was responsible for it. 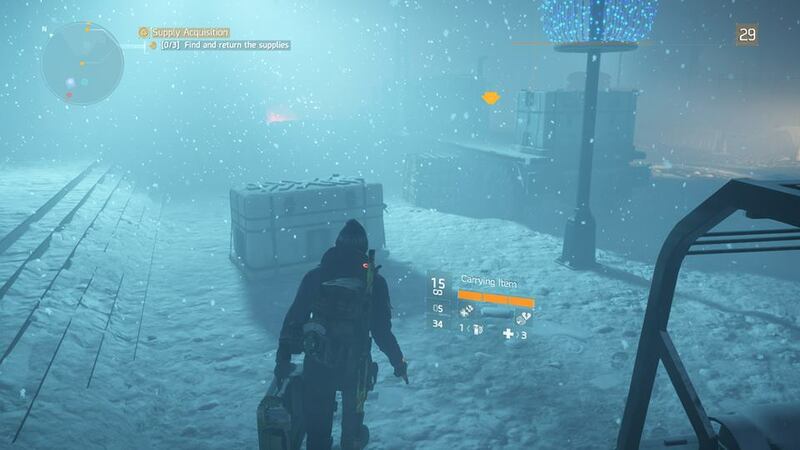 The other part of The Division I loved was The Dark Zone. I wrote about The Dark Zone during the beta and like the beta, it’s one of thee best parts of the game. The Dark Zone is an area of New York which no one controls. 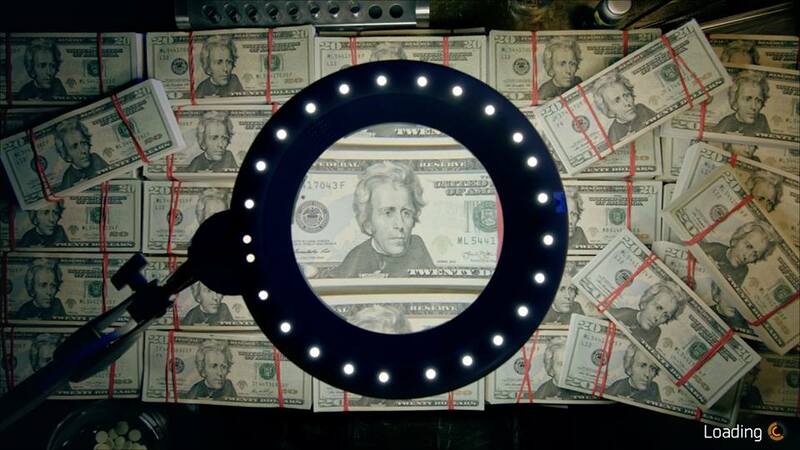 No criminals control it, no government agency controls it, no one. It’s a lawless and deadly area filled with higher level and tougher enemies. It’s also filled with great loot and other players who want that loot. And those players can kill you at anytime. Most of The Division isn’t like this. 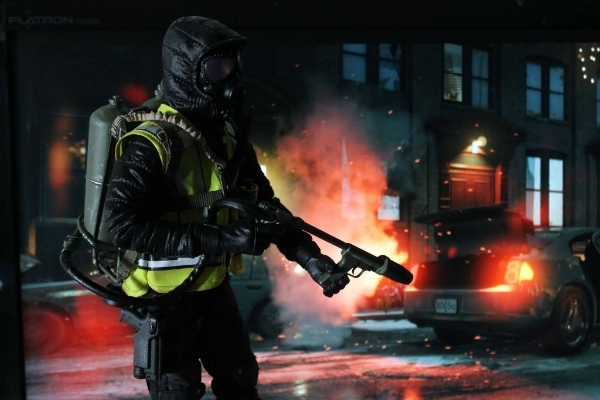 Outside of safe houses, The Division is a singleplayer or co-op game. But in The Dark Zone dozens of players run around and any of them can kill you or help you. Or both. Any loot you find in The Dark Zone has to be taken to an extraction point and you have to wait for a helicopter to come pick up your loot. Finding a great weapon immediately filled me with excitement and dread. I was excited to find something so good and I was dreading the fight I might have to put up to keep it. Extraction points can have tons of NPC enemies who will attack you and anyone nearby. These extraction areas are also limited and everyone in The Dark Zone knows when one is activated. Which means potentially tons of players could be coming to you and odds are some of them aren’t going to be friendly. The tension I felt in The Dark Zone was incredible and actually getting loot out of The Dark Zone is one of the best feelings I’ve had playing a game. The Dark Zone is also totally optional, for the most part. If you don’t care about getting all of the higher level weapons and gear, you can easily avoid it. But I recommend every player spend a few hours exploring the deadly Dark Zone, it’s one of the best parts of The Division. The Division is a BIG game filled with hundreds of missions, side activities and collectibles. Some of this content can get repetitive and without another player or two, The Division can become down right boring. The story is totally forgettable and ends with a “To Be Continued…” basically. But the combat is fun and you are constantly getting loot and exploring a huge map of New York. The Dark Zone is one of the coolest things I’ve experienced in a game and I can’t wait to jump back in the moment I’m done with this review. Games like The Division live and die on their content updates and their end game, which takes weeks and months to truly figure out. Ubisoft seems committed to adding lots of new content to the game, some of it free. But The Division as it is now is actually really cool and can be a lot of fun. Just make sure you have a friend or two who are willing to explore Manhattan with you.